Delicia Silva, better known as Cigar Vixen, graced us with a visit last November. This avid cigar reviewer toured our home along a fun group of companions as part of her very first “Beach & Cigar Safari” trip. 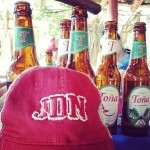 She also reviewed our Joya Red cigar while enjoying the beautiful beaches of Nicaragua. Watch Delicia’s quick journey through the heart of our operation. You’ll see our production floor, learn about the different components of a cigar, the tobacco types with which premium cigars are rolled, and the main stages up to quality control and packaging. “We had our first official cigar factory visit at Joya de Nicaragua, the oldest cigar factory in Nicaragua. Juan Martinez, Executive President of the company gave us a very informative presentation on the foundation of Joya which began in 1968. 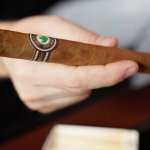 It was extremely impressive to see how much the company has gone through and been able to still come out ahead and produce some wonderful cigars. Everything from government control, factory bombing and devastating hurricanes. All of which their employees have stood by and in some cases helped to rebuild the factory. Our tour was lead by Mario Perez, Sales Director for JDN. He walked up through the ins and outs of the factory and really gave a thorough insight to how they make their cigars. After visiting Estelí, Delicia and her group left the valleys and mountains of northern Nicaragua for the hot and tropical southwest. 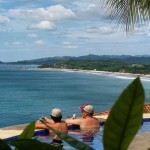 She enjoyed the magestic views of our Pacific coast while tasting and reviewing a Joya Red. We’ll spoil the surprise and let you know she liked it. So much, she actually featured it on Cigar Vixen’s Top 10 Cigars of 2014. Want to join her on the next Beach & Cigar Safari? Delicia will visit Nicaragua, and our factory, again this November… and you can join her! If you are interested in learning more about the trip, visit this link for details. 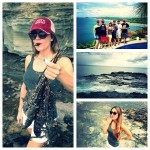 Check out these photos of her trip!